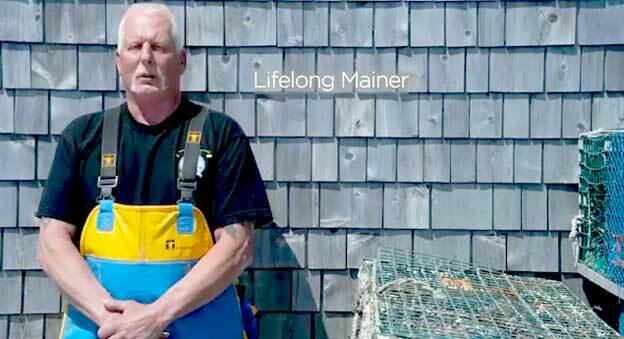 Rock Alley, President of the IAM Maine Lobstering Union Local 207, is featured in a recent TV ad promoting Maine Democratic gubernatorial candidate Mike Michaud. Rock Alley, President of the newly-formed IAM Maine Lobstering Union, IMLU Local 207, and Julie Eaton, Local 207 Secretary-Treasurer, were featured in a recent TV ad promoting Maine Democratic gubernatorial candidate Mike Michaud, a longtime friend of the IAM. Click here to watch the ad, entitled “I’m with Mike.” Alley, shown standing next to lobster catch bins, has four appearances in the ad. Eaton, wearing a black vest and red shirt, is shown twice. Michaud, currently a congressman representing Maine’s 2nd District, is running to unseat Republican incumbent Gov. Paul LePage, who in less than one term in office has made a name for himself as one of the most anti-worker governors in the country. LePage has rolled back child labor laws, slashed public employee pensions while exempting himself from the same cuts, and unsuccessfully tried three times to make Maine a “right-to-work” state. Michaud, a card-carrying member of the United Steelworkers, is an outspoken advocate for workers’ rights. He’s fought against free trade deals that ship U.S. jobs overseas, introduced legislation to require paid sick leave and was an original co-sponsor of the Employee Free Choice Act. “He’s listened to our concerns, and I know he’ll stand up for us,” Alley says of Michaud. “Mike has always stood up for what’s right for Mainers like me,” says Eaton. A July 18 poll shows Michaud with a slim five-point lead over LePage.